Group discussions are the best way to improve communication skills, gain confidence and knowledge. This is the reason many colleges and companies organize this activity by picking unique, difficult and sometimes easy group discussion topics. We have come up with a list of latest GD topics on current affairs 2019. These are the best group discussion topics on current affairs in India. You can select from these group discussion topics related to current affairs to organize a sizzling GD for your students. Given below is a list of top 15 Group Discussion (GD) topics on current affairs. 1. Is BJP better than Congress? 2. Being secular is good for India or not? 4. Facebook can be a big boost for business. 5. Is India all set to become a cashless economy? 6. How Modi’s “Make in India” is better than “Made in India”? 7. It is time that India should have Uniform Civil Code. 8. How GST has helped India grow? 9. How Chinese goods are a threat to Indian economy? 10. Replacing caste-based reservation with economic status-based reservation. 11. Is Modi the best prime minister of India in last two decades? 12. India needs a war or diplomatic cornering of Pakistan? 13. Juvenile crimes are on the rise in India. Yes or no? 14. Is women empowerment the solution for crime against women? 15. Are Indian states poorer than African states? Group discussions for school students and college goers have become an integral part of learning because they not only help students expand their knowledge but also add on to their confidence levels. In this post, we have come up with Group Discussion (GD) for college students. These group discussion topics for engineering students prepare them for facing various entrance exams and interviews in the career. 1. Should NOTA be removed from voting? 2. Business and Ethics don’t go hand in hand. 3. Is reservation for women good for India? 4. Are Indian news channels responsible or irresponsible? 5. Should live-in relationships be encouraged? 6. How big a threat is China to India? 7. How good a decision is to stop giving subsidy to agriculture is? 8. Which is a better system of politics in India- Two party or multi-party? 9. Is India really growing with increasing stress and health problems? 10. Television shows are badly influencing the youth. 11. Impact of social media on Indian values. 12. Pros and cons of using Facebook for business. 13. Entrepreneurship is not everyone’s cup of tea. 14. Leaders are born and not made. 15. Managers are same as leaders. Training Need Analysis is used to identify the gap between the needs of training and the training of employee. This forms the first stage of the process of training to know whether training can resolve the issues that have been identified. TNA comprises of training needs analysis worksheet which forms the training needs analysis form for employees. Sample Training Needs Assessment template and Training needs analysis questionnaire are very helpful in this process. Given below is a Training Needs Analysis template in Excel format. Use this organizational training needs analysis template subjective to your needs. Given below is a Training Need Identification format for your reference. This format consists of functional and behavioural aspects along with proposed area for development. This form also defines the criticality of development. 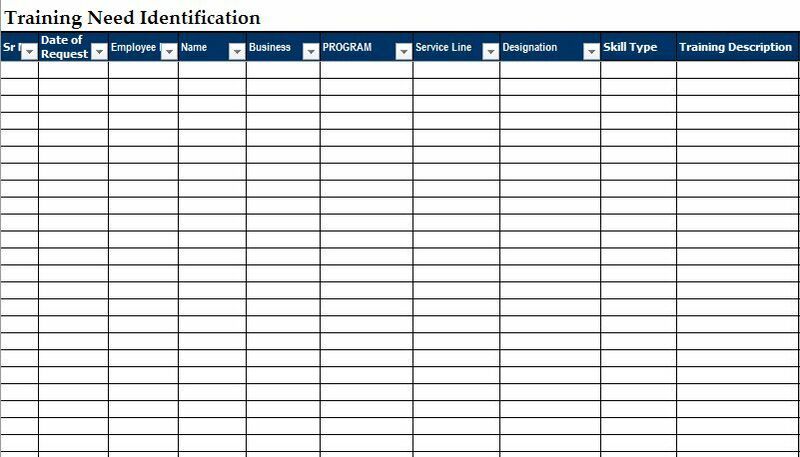 Use this Training Need Identification sample designed in Excel format. You can download it and use it to have all your needs met. It is a self declaration format which consists of complete declaration of an employee. It includes history of his learning in form of training programs he has been a part of, his professional experience, his academic qualifications, his professional qualifications, his professional memberships and details on his work exposure. This gives complete detail on the knowledge, experience and learning a person possesses. Companies roll out policies for everything to ensure smooth and controversy- free working with their employees. In some companies, employees have to travel often, domestic or international. For that purpose, they design Foreign Travel Policy for employees and also Domestic Travel Policy. This policy has clearly state company travel policy and procedure. It works as company employee handbook with Local Travel Policy for employees in India along with travel reimbursement policy for employees. In this post, we have come up with a sample corporate travel policy for employees. This business travel policy sample includes all important points that are a part of the policy. What is the Best Way to Manage Sandwich Leave? When you take leaves on Saturday and Monday then Sunday is also counted as a leave as per Sandwich leave name. This kind of combination is called Sandwich Leave concept when a paid holiday gets sandwiched between two leaves. Sandwich leave policy is followed by many companies with an intention to stop their employees from taking leaves at a stretch and also enjoy benefits of paid leaves. There are various other policies in this like Sandwich Leave Policy for earned leave. So if you plan to take leave between two holidays then get prepared to witness the loss of pay. In this post, we have come up with some small and smart moves to make the most of your leaves along with Sandwich Leave policy rule in your company. If you are planning to take Saturday and Monday as off then you must serve your office for half day either on Saturday or Monday. You can keep your loss to minimum by taking off on Friday and Saturday along with Sunday or Monday and Tuesday along with Sunday to at least enjoy one paid leave instead of no paid leave. If your company allows work from home then you can work from home one day before or after Sunday and take one day as leave. This is quite a debatable issue and is very subjective to the HR policies of the company. Therefore, have everything clarified with your HR Manager before taking an off like that. Design the Leave Policy of your company using the draft as the base for customization. Employee verification is an important process before finally recruiting any person in the company. For this, you can submit a request for employee verification to the company where the employee is presently working or has worked in near future. Some companies have HRs doing this job while some companies hire third party services to do the same. Warning Letter for not submitting documents for Employee Verification and email for the same are few important formats you might require. Given below is a formal employee verification email format. Customize and use this employee verification email sample and template as per your requirement. Kindly provide the following details of the above mentioned candidate. We will look forward for your responses and would appreciate if you could fill the details at the earliest. Please get in touch with us at 9898989898 or revert us on the same email. We are thankful for your time and help. The ESIC name change process can only be done in offline mode. There is no online platform or process for changing employee name in ESIC portal. However, an employer can change the nominee details, details of family members and other additional details in ESIC employer portal. Before knowing the process to change employee name in ESIC portal, one should sought out the reasons for wrong names in ESIC portal. Wrong names generally happen when the employer misspells an employee name during the registration process in the portal. In order to successfully change the IP name in ESIC portal, the employee needs to submit a proper request letter seeking correction of his/her name in the regional ESIC office. The request letter, however, should be attested effectively by the employer. Without any attestation, the Employee State Insurance Corporation would never change the name of the employee. Kindly refer the sample ESIC name correction letter format for application. This to draw your attention to that the name of the above employee RAHUL CHAWLA, ESIC No: 7422xxx469 has been entered wrongly during the registration process. The correct name of the person is RAHUL CHAWLA, but in ESIC portal it has entered as RAHUL CHAWLA. As such, we kindly request you to please correct and enter the name properly to RAHUL CHAWLA. For Maheshwari Tea Co. Pvt. Ltd. Note: This letter and esic correction form should be taken a printout on company letter head. After preparing the letter, either the employee or employer needs to submit it in the nearest regional ESIC office. The ESCI would make the necessary corrections to employee name within a span of 15-30 days. Click Here to Download ESIC Name Change Letter In Word and PDF Format. The universal account number (UAN) is given to every employee working in a registered company of India. UAN number is necessary for checking EPF balance. 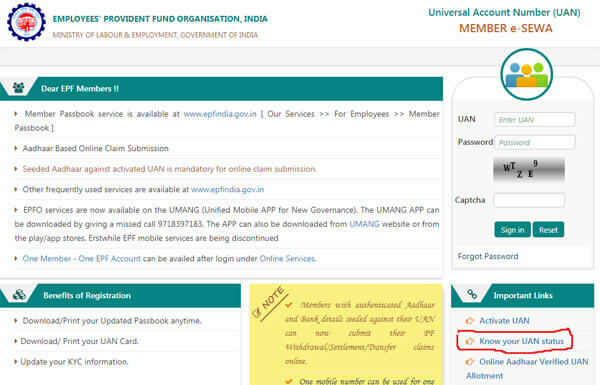 If UAN number is not known then UAN number can be obtained by registering in Unified Member Portal and EPFO Unified Portal. Every employee who is working in a registered company in India, makes some contributions from monthly income to provident fund. This PF amount is linked to unique account number by Employee. The employee has many benefits by saving in EPF. With the help of UAN, an employee can check the status of his EPF balance, transfer or withdraw the amount saved in PF. Sometimes the employee forgets his UAN and tries to get it from PAN or Aadhar card number He will have many questions and queries regarding how to get UAN from PAN. Every employee who works in registered office in India ill have PF account. He will be asked to submit his/her PAN number for taxation purpose. This PAN number will be linked to UAN number. If the linkage is not done, it is not possible to get UAN number. Usually the payroll department of the employer takes care of all this procedure. Step 1: Login to UAN member portal and select know your UAN status on home page. Step 2: You will get different options to get UAN through PAN or Aadhar card or PF number. Select PAN and enter PAN number and other details. Step 3: Click on get authorization Pin, then you will receive OTP to the registered mobile number. Enter OTP and click on validate and get UAN. There is every possibility that you may forget your UAN number. Then the question arises what to do. 1. If your UAN is activated, and you have updated your mobile number for provident number then you can give a missed call to this toll free number 011-22901406. EPFO will send all your credentials in SMS. 2. Your employer will definitely have your UAN number. Reach out to him and ask for UAN number. 3. Go to EPFO site. Under “Our services” option, click on for the employees option and then click on UAN helpdesk option. You will be directed to another page, where you have to define your problem, provide updated mobile number and PAN details. A OTP will be generated and sent to your mobile number, which has to be filled on the portal in the given space. You will receive an application id. EPFO will resolve your problem and will send UAN number and details to your mobile number. Every employee working in any registered company in India will have a UAN linked to his PAN card. If your company has not given or has not generated, you can generate UAN number yourself. Step 5: Check the declaration and click on Registration button. Step 6: You are done, the process is complete. Every employee can check the status of UAN online. Go to the EPFO portal. Select your state and provide the EPFO account number to check UAN status.